The largest collection of English pool tables in Europe, many exclusive to us. Lowest prices, backed up by award winning service, with free delivery on everything. Finance available. At Home Leisure Direct we offer the largest selection of English pool tables in the country, with a vast range on display in our Bristol showrooms where you can try them for yourself. Our award-winning team have all of the experience and knowledge you’ll need to help you to choose an English pool table. We pride ourselves on our service and will be able to advise you as much or as little as you need. We stock the finest quality English pool tables from all of the best manufacturers in the world, including (but not limited to) the very best based in the UK. We stock tables from family businesses in the UK who employ expert craftsmen that have been building professional pool tables for generations, as well as tables from France, Spain and even further afield. English pool refers to the style of game, not the place of manufacture, so we search the globe for the very best manufacturers of English 8-ball pool tables. English 8-ball pool differs from American pool by having smaller pockets (and smaller balls), making for a more thoughtful and tactical game than the faster American pool. English pool tables are generally smaller in size, although you can get 8ft pool tables and 9ft pool tables in English style. 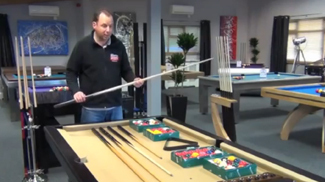 The standard English size is a 7ft pool table, which is the size on which UK official tournaments are played. In commercial environments and pubs, 6ft and 7ft English Pool Tables are by far the most common. We exclusively supply slate bed pool tables, regardless of whether the table will be used in a home or commercial environment. Slate bed tables are simply the best quality, and those with a wood bed just don’t compare. We pride ourselves on the quality of our tables and will never supply anything below our extremely high standards. Through our experience of selling pool tables over many years, we’ve had a lot of questions and feedback from customers on the features they’re looking for. Having taken this feedback on board, we’ve created the Signature range of tables, which caters for these needs and desires, to create a range of pool tables that are simply the best on the market. The Signature range includes pool tables which have been designed by our own in-house team to include most-requested features as well as the finest build quality, and aesthetics that will make them a great addition to any games room. The entire Signature range has been designed and hand-built by craftsmen in the UK, ensuring you benefit from the highest quality product as well as supporting our own economy. We use the best materials and fine workmanship that comes from years of experience.